So I am a week on as the full time carer for Dominic, and I have learned a great deal this week…. but it is shadowed as my faith in humanity has been pushed to its limits, as Iv heard of what my species is capable of. I know humans can be ignorant to suffering, and I do not blame them for this, I too once was, before i was vegan for instance, i would love animals deeply, yet if you showed me a slaughter i would likely weep, or have a sleepless night… yet woke up the next day having not changed, or any intention of changing. So I know humans can be ignorant, i know we are complex and may not see the damage we do to a person, animal or the environment, and i know we often may not intend to inflict pain or suffering, yet can by accident through lack of education or psychological floors such as cognitive dissonance….. So this will be an usual weekly blog, as i am more wanting to speak of two events that have stood out among the week… and all it has raised with in me. One situation is an ongoing issue in Tanzania, and i will speak of this firstly, as at least this one i have some minor form of understanding and explanation for…. Earlier this week the local secondary school contacted me, it was about a young lady in my fund whose name is Anna. They needed my help, Anna is a little different, as she is was born an Albino. 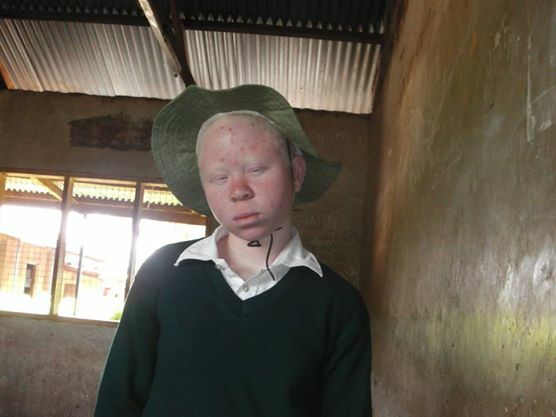 Albinism is a major issue in East Africa, I am sure you have heard of western children wearing space suit like set ups to play, and that is in the west where the sun is a great deal weaker and less persistent than her in Tanzania! Naturally this makes life that little more difficult for an albino child here. This is not however the issue the school needed my help with, the problem faced was something far more sinister than the suns rays…. Sadly and, barely believably, children like Anna are at risk from an evil that belongs in the dark ages. Witch Doctors hunt such children, kidnap them and I hate to even type this, but then sell albino body parts, or use it in ritual magic. The school want her to sleep at the school where the security are, to ensure her safety at night, and on the walk home from school… This actually has lead to us wondering if Anna is safer living here with Dominic and I at the site. I have the best alarm system in Tanzania with nearly 20 dogs outside and the night watchman too… So time will tell on that i guess….. I know many of you will barely believe it to be so, that children’s body parts can be a commodity here, but sadly it is so… This is just one reason why education is one of the most precious gifts humanity has to share, these men and women believe what they are doing to be true, to be real, to be okay! I have said this before, we are all born human animals, impressionable, and to some degree fickle….. but to earn the right to be called a human being, many never make it there, and many are never given the chance to, or the tools. A child raised by a witch doctor, will be a dark human when they are older…. It’s just how it will be, and only education can light that darkness, and we can only hope eventually eliminate it altogether, not just here, but all over the planet. The next thing is a little harder to stomach believe it or not. Iv deliberated many a time about sharing things Iv seen, and heard and lived through here. Sometimes I feel it is not fair to just unsettle a person with it, but then i think, if a person is sheltered from reality, and doesn’t know what it is like this sometimes, how will people ever know to get up and help, and light the darkness that has a grip over peoples lives in the developing and developed world for that matter. I spotted scars on the top of Dominics legs, and how they got there has almost broken my heart in every way imaginable. The lady who took Dominic in… well she has abused little Dominic in a multitude of un-explainable ways. Other than feeding him flour and salt, whilst she ate well in front of him, other than working him hard on the farm, and collecting fire wood, despite his tiny stature and constant tiredness from the HIV. Other than beating him around the head when she was drunk, other than causing him to shake with fear as she entered the house at night, as he never knew if she would just go to sleep drunk, or come to Dominics room, and perform a beating or some other form of abuse. The scars on the legs though, they stand out, like a scene from a horror movie, they stand tall in a whole sea of abuse that he faced whilst living with her. He told me how he traveled to the mountains alone for 4 days in the midst of all this, to see about life there. It was where his mother was born and he wants so desperately to connect to her, for all she has passed on many years ago now. He clutches her photo each night, as if that worn out piece of card provides him with the love we all seek in life. He spent 3 days in a community called Rombo, walking around and asking if he could live with families there……. On the 4th day he was hungry and decided there was no life in Rombo for him after all, and headed back to Uchira to eat his flour, and face his abusive guardian. So I won’t give full details about the scars on little Dominic, as i see no need, but it was a form of torture he was subjected too ultimately, involving scissors held over a fire to heat them up……. as Dominic opened up and spent hours telling me all he had faced that night, I felt the emotion of it all rising in me. Iv said this before, that I thought I had experienced all emotions when i came here, but Uchira has introduced me to whole new spectrum of emotions is how it now feels, many iv no words to describe, or do justice too. What i was feeling was a kind of grief i think, but that shifted to anger…. I don’t get angry to often, I do all i can to find ways to be empathetic with most people, but this woman and her actions are still beyond the reaches of my empathy as i type this…. As Dominic told me all of this that night over dinner, I just kept thinking, thank god he is here now….Thank god he found me, and I he…. 🙂 He has dealt with all of this so well… he sat back as cheerful as ever, and I could see he was sensing my concern and uneasiness of knowing what I now did….. he smiled and said jokingly “My life is DvD!”………. What an amazing child he is and has become given all he has faced alone over the years. This all opened something in me, a further urgency, to begin a new program, to dig as deep into the lives of the children in the fund as I possibly can…. and as fast as I can. Those with guardians and not living parents will be first for a new social work drive with in the fund. It also confirmed to me my choice to make this work somehow, I have no guaranteed funding or support for this children’s home, but Iv got the intention to make it work, and i now know in all its severity first hand why some of the children need me to make this work…. there are many children here, and Iv no idea how many are facing lives like Dominic has, I just hope those that are, if they are, find their way to me, or I to them soon..
Part of my decision to share this is with that in mind, that people can know why I have begun this childrens home, and why children in places like Uchira, need us to treat them as our own children at times i believe…. and why children in places like this need to be seen as our responsibility. The developing world does not have systems like the west, so we have at least a moral responsibility as humans, to protect children. Most of us know this is a universal truth, that we should protect and shelter children; but I feel we must come to know that it can, and should include, even those children we may not see each day but know are out there. This is a lady who attends the catholic church every day, and is respected for doing so in the community. I respect many religious people, and see many doing great works in the world. Yet this is again a time in my life where i must question why religions often fail people like this. They focus on the wrong things is why, they often do not show a person how to change, how to develop, to love…. but in the west they show people how to ask forgiveness and go on doing wrong at times…. All the while waiting for, and looking to a man in the sky to come down and make the world all better. Well it does not work that way! Jesus was a man, empowered by an energy he called the Christ. It is my belief that humans, and religious preachers, simply must learn to meditate, pray; learn to be disciplined and to discipline their 5 senses… and call on that energy to work through them and with them as Jesus did, as Buddha did, as Ghandi did, as Martin Luther did, as Nelson Mandella did all of these people and a great many more had something in common, they had fasted and prayed, and gave themselves to be vessels of that energy, that love… to change themselves from with in, in order help bring about change, instead of waiting for change to fly in on a cloud and happen one day. If there is a battle of light and dark, good and evil, where I am in life its clear to me that the light is winning….